Folding Trampoline Discounts Apply ! Tough weatherproof mat and tublar steel frame with a durable coated finish. 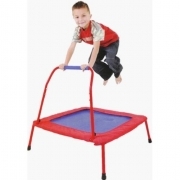 Padded cover around the mat that cushions the frame and prevents children from stepping through the bungee cord. Yes - BUNGEE CORD instead of metal springs, which creates potential safety issues and pinched fingers. Folds up for ease of storage. Sorry - Self assembly. But full instructions are included!